A hallmark of our School is milieu treatment. The treatment and support of our students is designed to be all encompassing. All activities and events are seen as therapeutic opportunities and all aspects of a student's day are given considerable thought, care and attention. Members of a treatment team - including teachers, therapists, counselors, program managers work cohesively to create a consistent and meaningful experience throughout each day. At the heart of the Orthogenic School's residential program is the milieu staff. The Orthogenic School relies upon the therapeutic relationships that develop between a student and his or her counselors as a major component of the treatment. Milieu staff members are actively involved with the students throughout the day, not simply monitoring or supervising them but developing bonds and relationships with students that create a structure in which each child or adolescent can receive emotional support, develop new skills and sustain healthy relationships. The Residential milieu is directed by a clinical psychologist and the each residential dormitory is under the leadership certified clinical staff. On-going in-service training opportunities are provided to all staff members, including a 24 hour certification course in Therapeutic Crisis Intervention, American Red Cross first aid and CPR, and the University of Oklahoma's Residential and Youth Professional Child Care Certification. For students who are at least 16 years old and preparing to leave the Orthogenic School and transition back home to High School or perhaps on to college, our transitional living center offers an opportunity to become increasingly independent. For additional information about our TLC program click here. Individual Therapy - All of our students participate in individual therapy on an ongoing and consistent basis. All of our therapists are licensed clinical professionals or post-doctoral fellows , interns, externs who are supervised by licensed clinicians. 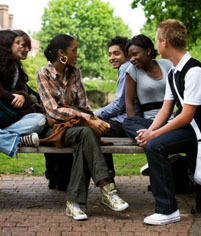 Group therapy - the School offers a range of 60 minute therapy groups for all of our students. Group therapy is a weekly process which reflects considerable thought and care around each student's psychological needs and interactions. Family Therapy - At the Orthogenic School, we value and welcome the involvement of the family in the therapeutic process. The frequency and duration of family therapy for Residential and Day School families is typically an hour, twice a month. For those families where distance is a factor, we will make all accommodations possible in order to ensure that family therapy occurs on a regular and reasonable schedule. As students prepare for a transition from the Orthogenic School, more frequent family therapy sessions are recommended. In order to ensure the safety and well-being of all of the Orthogenic School students, the school provides 24 hour a day on-call psychiatric and medical services including a weekly psychiatric clinic and sick-call. Psychiatric services are provided through Rush Medical Center under the direction of Dr. Louis Kraus, MD, the Department Head of Child and Adolescent Psychiatry. Medical services are provided by the University of Chicago's Department of Developmental Pediatrics under the direction of Dr. Peter J. Smith. The school also has both a full time pediatric nurse and a full time psychiatric nurse who provide nursing coverage during and after school. Education is an integral part of the therapeutic milieu. While our school is small (only six base classrooms) it is a hive of activity during the school day. Four of our classrooms are dedicated to High School students who participate in a departmentalized academic program. We have two self-contained elementary school classrooms, one for younger elementary students and one for Junior High level students, and all of our elementary students participate in P.E., Foreign Language, and Fine Arts as part of their weekly schedule. Click the image to the left for a more detailed PDF of our Academic Calendar. Our curriculum is shared with each student's home school district to facilitate the collaborative process. Curriculum development is an ongoing process at the Orthogenic School and we continually work to devise meaningful instruction that, while addressing each student's I.E.P. goals and unique learning style, also remains relevant to the home school curricula and anticipated graduation requirements. To enhance our educational programming, our School boasts a strong Literary Arts Magazine, Journalism Program & Junior Achievement Chapter. These collaborative, product based courses provide our students with hands on opportunities to build skills and portfolios for future endeavors. Click on the galleries below to learn more about the programs. Click the image above to view a gallery of our Award winning Literary Magazine, Orthogenique. Click the image above to view a gallery of our school newspaper, the Yellow Door Chronicles. The students at the Orthogenic School are encouraged to develop a strong work ethic, increase their skills, and contribute to their communities. Our work program provides over two-thirds of our students the opportunity to develop these skills right here in our School and with the ongoing structure and support of the milieu. To see an overview of the Student Work Program, a list of job opportunities and a sample application click the image to the right. Our Day School is quickly becoming an integral part of the larger Orthogenic School program and community. The mere existence of the Day School program speaks to the evolving philosophy of the Orthogenic School. For many students, the Day School program means that the Orthogenic School can now offer a step in between a child attending a residential school and attending his/her home school with supportive services. The School and the family work together to create a consistent experience for each day school student. In this way, a student's activities at home can be supported during the school day and the opposite can be true as well. While there are only a limited number of Day School spaces, this program has provided an important resource. A culture of care and support are values that are developing among the Day School students. The Day School students are learning how to be a support system for one another as they face challenges that are exclusive to the Day School population. Although our Day School students represent a wide variety of ages, in true Orthogenic School fashion, each member is acknowledged for his/her personal strengths and abilities and is able to find a niche among our intimate community. Ultimately, most days, each member of the community supports lone another as they make the changes that are necessary to be successful in facing the life that awaits them beyond the yellow door.